About a year ago, I was enjoying an exotic cocktail in the lounge of the Trader Vic's in Scottsdale, Arizona waiting to meet a friend of mine, Mr. Dewey Webb, to talk about the history of tiki in Phoenix. We chatted for a while about tiki establishments long gone from the Valley of the Sun like the Islands Restaurant, The Samoan Village and Kon Tiki Motels, the original Trader Vic's location in Scottsdale, etc. Then he shared with me a copy of an original sales brochure for a Hawaiian inspired resdential neighborhood on the west side of Phoenix called Sands West. I asked where he found such a rare item and he told me that his family had kept it from when they originally bought a house in Sands West. Sands West was built in 1961 and was a big hit. 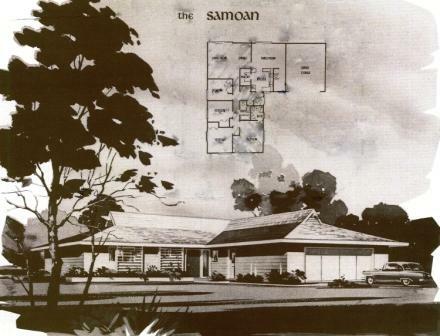 So much so, that just a few years later in 1965, a second Hawaiian themed neighborhood was built just 10 blocks west of Sands West, called Sands Oasis (that's a topic for a follow-up post). I love that the sales and marketing staff came up with Kumuanahanahana - the Phoenix Tiki God of Air Conditioning! I've since been out to explore Sands West and most of the homes are in need of some TLC. 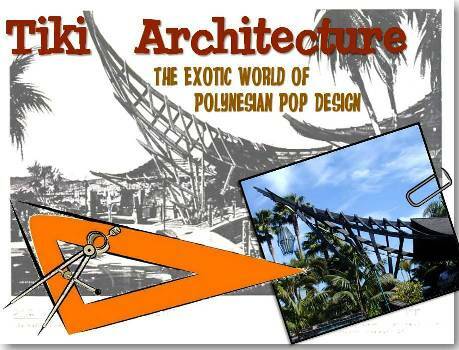 However, there are still a few select home owners that have not cut off all of the outrigger beams or modified the house beyond their original Phoneix Polynesian design. If you want to explore Sands West for yourself, the neighborhood is located between 32nd / 35th Ave and Northern Ave / Belmont Ave.
Part 2 of the story is continued in this post about the nearby Sands Oasis development. Love the brochure, got such a kick out of it! Orange graphic patterns would make a wonderful retro fabric design! Thanks for sharing this. What a fun neighborhood. I really enjoyed the pictures. Arizona chuckwagon Barbecue is far superior to fire-basted octopus! I remember Sands West and the kids from there when I was teaching at Palo Verde School. Dewey was one of my students in 1962. MEET ME AT COMIC CON REVOLUTION ONTARIO! MAY 18-19, 2019!